Riding off of last night's win, Briercrest Women's Volleyball team came into today's game against Red Deer College determined to keep their three game winning streak alive. Briercrest was able to extend their winning streak to four after beating Red Deer College in four sets (25-13, 25-16, 25-23, 26-24). The first set started off with high energy from both teams battling point-for-point. Briercrest kicked it up a notch and started to pull ahead of Red Deer. With two straight service aces from Mia Harder, Briercrest was unstoppable. Red Deer felt the pressure of Briercrest's increasing lead and called timeout at 11-6. Briercrest couldn't be stopped though and forced Red Deer into another dire timeout at 16-7. Briercrest did not have an attack error their 17thpoint making for a riveting set. Briercrest locked in their first set win at 25-13. Red Deer knew they needed to start something in order to stay in the game after the first set. With that in mind, they came in with a new found momentum. Red Deer pulled ahead of Briercrest after they led for a few points. Briercrest tried to break their momentum and gain their own after calling time out 15-17. Red Deer was on fire though and continued to add to the score. With one last attempt to stop Red Deer, Briercrest called timeout at 16-24. Red Deer took the second set though at 16-25. With a tied game, both teams were looking to pull ahead with another set win. Red Deer carried over their intensity and took an early lead. Briercrest called a timeout at 10-15 in hopes of being able to get something started. With fresh new minds, Briercrest started to close the gap on Red Deer. Red Deer felt the pressure and called timeout at 17-16 and 19-22. Briercrest continued to make several kills and digs allowing them to take the third set 25-23. Knowing this could be their last set, Red Deer came prepared to fight in the fourth set. Both teams rallied back-and-forth, battling point-for-point. Red Deer then started to pull ahead causing Briercrest to take a timeout at 13-16. Red Deer continued to keep tensions high in the Hangar by increasing their lead. Briercrest called timeout once again at 13-19. The timeout gave Briercrest exactly what they needed and scored 8 points in a row, closing the gap and taking the lead. The end was tight, with both teams fighting to win. Briercrest was able to claim the game point at 26-24. Justine Collin was awarded Player of the Game by alumni, Janae Rapley. 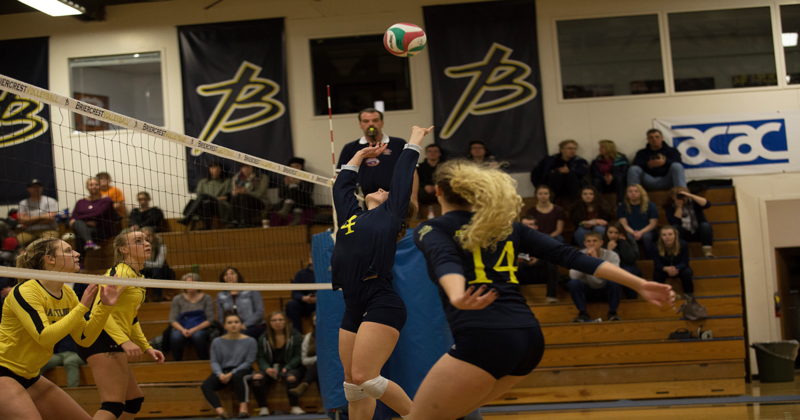 Rapley played 4 years for the Briercrest Women's Volleyball team, finished her career at #2 in all-time service aces in the ACAC and won the first ever ACAC Championships for Briercrest Women's Volleyball in 2015-2016. Collins had 1 service ace, a team high of 14 digs (along with Kirsty Kindrachuk) and a game high of 14 kills. Ashley Erickson had a game high of 41 assists, and Mia Harder and Mikayla Benterud had a game high of 5 service aces. Briercrest dominated in the stats category with 44-36 kills, 59-57 digs, 43-34 assists and 16-2 service aces. Tune in next Friday on the ACAC websiteas Briercrest takes on Olds College at Briercrest once again. For up to date information on the Briercrest Volleyball teams and other Briercrest sport teams, "like" the Facebookpage.